The table topper is adorable Vickie! I love making table toppers and yours is refreshingly new to me - can't wait to try it! Both prizes are great - thanks for the giveaway! I love your new pattern - really cute! What a lovely tabletopper! I love the bright colors and the nice little stars. I tried to go to Moda to leave a comment but i couldn't find where to do it. Adorable tabletopper! I too love the bright colors! I never win giveaways, but I wanted to say I love this table topper! And if this is the 1st giveaway I could actually win, well, that's just bonus. Beautiful table topper. I really like the stars in this design. Congratulations on another pattern on Moda Bake Shop (and thank you too). Love that table topper. Am off to visit moda bakeshop to check out the recipe. Congratulations on another pattern on the site. 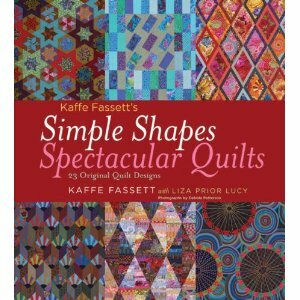 I love my Kaffe book but oh the chance to win the fat quarters-what can I say! That table topper is adorable! I clicked right through to MBS, but I don't see your project on there... I would LOVE to make it for my table!!! Your table topper is darling. I'm going to make one with snowflake fabric and leave it out for the new year. I think your new pattern for the bake shop is great. So talented you are. Cute table topper. I just love your quick projects. That is an awesome table topper! I will definitely be trying this recipe. Thank you for this opportunity. Love that table topper! I would also love some new fabric in my stash! ;o) Thanks for the chance. Love your table topper! I have the one ruler already and have yet to use it, now I have a good reason to! I love the table topper (and the giveaway!). Thanks. I just saw your table runner on Moda Bake Shop and left a comment. I must say I was very impressed with it. I am looking to do some table runners for very late Christmas gifts and that is one that I will do. I just bookmarked your moda bake shop project. Will add it to my to do list. I really like the fabrics and your tutorial was great. Thanks for the giveaway! I think the topper is so cute. I can't wait to try it! The table topper is cute! Love reading your blog! thanks for all the tutorials. This new one is now definitely a favorite. Love your table topper, definitely on my list of "must-make" things!! Such a cute table topper. I envision making a Christmas one, but it may have to wait until next Christmas. Such a lovely table topper. I love the stars. Thank you for another giveaway. Your new project is too cute! I just love the clear colors with lots of white. Thanks for having this giveaway! Your table topper is wonderful! I love the dot background as it makes the colors pop. Thanks for having such a great giveaway. Darling pattern and great giveaway, Thanks! This is a lovely pattern! And thanks so much for this great give away! Your table topper is lovely. Thanks for the great giveaway. Oh, I've been wanting some Fandango! And, that book looks fabulous. Thanks for the chance to enter. I also looked at the Bake Shop & I really like the star block. It makes me think of an easier & less crazy-making Jacob's Coat. Your table topper is wonderful! Thank you for sharing! Fandango is beautiful and many thanks for your generous giveaway!! I think a quilt full of star drops would be fantastic. Your tutorial makes them look simple and fun to make. I'd love to have some Fandango! I already have the book, it's fantastic like all Kaffe's books. Looked at the Bake Shop, I like the star block, a quilt with these stars will be wonderful. Thanks this great give away! Lovely table topper - it would look stunning in navy and gold to make those stars really pop!! Another great giveaway too - thanks! A fabulous giveaway! Thanks for a chance to win. Great project for a holiday break! I'd love to win the fandango fabric and make it with that. I would never have thought you could make these lovely stars by machine. Wonderful tutorial! The table topper is gorgeous! I have been wanting to get some Fandango too! I love this table topper! There are so many color schemes that one can use for this. I haven't made a table topper before, so looks like I will have to make one now! Another great project! Merry Christmas Vickie! Thanks for the chance to win! Both prizes are amazing :) I love the table topper too! I love the star drops pattern! I'd also love to win. ;-) I'm a new quilter and pretty excited about all of this. Guess I need to buy some rulers so I can do the fancy stuff. Such a pretty pattern and I love the choice of fabric! Thanks for such a great giveaway! The table topper is wonderful, love the colors. What great prizes, thanks for the chance. would love to win this book thanks! I love it! And there is still some time left to whip up for someone you love! Cute table topper. Thanks for having a giveaway. all my favorite fabrics from this line! how cute! Another project to add to my 2011 list! And Thanks!! for the chance to win!! I'd love to win the fat quarters since I already own the book. Great table topper - I'll have to check that one out! Count me in on the fat quarters - I'd love to play with new fabric! The table topper is so pretty! Thanks for the chance toe win! What a beautiful table topper. Great job! I would love to win the fabric although I wouldn't mind that book either. That has got to be a great book and probably has wonderful information in it. If my name was chosen, I would love either one. Crazy about that table topper! Fandango's one of my favorites and who doesn't love Kaffe! Thanks for the opportunity and happy holidays! I'd love to get my mitts on some Fandango (or Kaffe's book for that matter)! Cute project. I will be hunting up the rulers/templates. I love the table topper!! Either prize would be such a treat! I love Modas Fandando and Kaffe's book! Love your table topper. Thanks for the giveaway. Vickie, I love this topper! What a great pattern! Thank you, you make it look so easy. The table topper is darling! Thanks for the wonderful giveaway! Yeah, Love both items! Thanks! I found you at Moda Bake Shop. What lovely toppers. I am now a follower. I love the stars and the lovely colors you picked. Oooh. Fabric. Thanks for the tutorial. This is one quilt block I might have to try. Thanks for the giveaway and I enjoyed your project on the bakeshop. Good for you on another great MBS treat! Thanks for the generous giveaway! I really love this project!! Great little table topper and a very generous giveaway. Thanks. I love the pattern. Very pretty colors that you used too. Great Giveaway.. I would love, love a chance to win.. please enter me for an opporunity. Ooo super cute table topper! You make it look too easy... thanks for the tute. I would love to win such a generous giveaway! That table topper wants to be made! But first I must finish the last Christmas present. Thanks for having the giveaway! great prizes. thanks for the chance to win. wishing you a great holiday season. What amazing fabric and the book looks awesome too. I find reading your blog very inspirational and motivating. I would love to win either. Merry Christmas! Cute table topper. Thanks for the give away. I love the design of this table topper! I love your new table topper! I can't wait to try making it!!!! Merry Christmas! Thank you so much for the table topper pattern. I am thinking that I may start making several of these as a "head start" for Christmas gifts for next year. I love the simplicity of the table topper. Thank you. I love star patterns! Can't wait to try this one out. Pretty table topper - great for any time of the year! Thanks for posting and sharing yet another give away! What a great tabletopper! Fandango...ohhhh...I love that line! I never win, but thanks so much for the opportunity! cute pattern. Now why did it now show up on my blogger list of new blog posts? I am off ot investigate! How pretty! Off to check out the bakeshop right now. That is cute! Cool colors also. I love the Star Drops Pattern. I am headed over to Moda Bake Shop when I am done here. Thank you for the great blog and give-away. Take care and God bless, Cory. I love this simple little pattern! Can't wait to give it a try. Both of your give-aways are extremely generous of you. Happy Holidays! The table topper is beautiful! I loved the simple step by step photos of the whole process. If I don't win I think I am still going to try to make one myself. I think there's going to be some Stars Dropped on a couple of my tables. I'm going to have to get that 40 degree ruler, I thought I had them all! Thank you for the great tutorial and the giveaway prizes. I am going to try out the table topper pattern this week while on vacation. I would love to win, PULEEEEEEEZ! What an awesome tabletopper and awesome prizes! Thanks for a chance to win. What a nice Christmas present this would be if I were to win either one of the great prizes. Congrats on a Bake Shop design. Thanks! Thank you for the Table Topper pattern on the Moda Bake Shop. I really appreciate the design talents shared and the marvelous projects which are now on my 'to-do-one-day' list! Well done, Vickie!! I love it!! You are amazing!! Many thanks! Have a wonderful Christmas and all the best!! I've never been too big on table toppers, but when I saw this one on the Moda Bake Shop it was so bright and cheery that it caught my attention!. Well done. The tutorial was very easy to understand too. I saw this on MBS this morning. I LOVE it. I am definitely going to give this one a try. Cute table topper! Going to check it out right now! Thanks for sharing! I found this sweet project on the Bake Shop site. So cheerful, would be a happy thing to work on during the dark of winter. The book looks like I would love it. I know I would love to win it. I enjoy your blog so much.Thank you for your inspiration. Star Drops is such a catchy name, especially at this season of the year. Both your gifts are so lovely. I've just found you through the Moda bakeshop. What a great table topper. I think I have time before christmas to squeeze one in :-) Thanks so much! The table topper is great and it would be a perfect gift for my cousin. LOVE LOVE YOUR TABLE TOPPER-I'M GOING TO MAKE ONE SIMILAR! THANKS FOR SHARING-LOVE TO WIN THE FQS! Cute table topper! Looks like a great last minute gift. Cute table topper! I LOVE Fandango :-) Thanks for such a great giveaway! The Star Drop Table Topper was great and your give away but the icing on the cake!! I would love to win that Fandango Fat Qtr bundle! That is a great pattern and thanks for introducing new tools. I really love this tutorial. Its so easy and cute! Wow, Vickie, what an impressive "starlight" table topper! I enjoy making these smaller quilts, because they go together quickly. Thank you so much for sharing your tutorial with us. I would like to make it in Christmas fabrics. It would be so fun to win this fqtr bundle too! Take a deep breath, relax and have a Happy Holiday Season! Thanks for the giveaway! 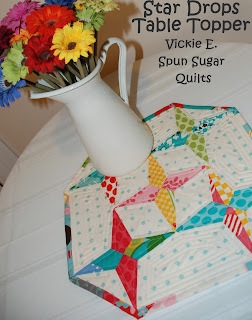 I would love to win the FQs especially :) I also left a comment on your tutorial. The table topper looks great ...thanks for the great giveaway!! Have a great Christmas & New Years!! That table topper is really cute! Thanks for doing a giveaway!! Merry Christmas! Congrats and thanks on the tutorial! You made it look really easy! Thanks for the giveaway! love the stars. thanks for the tutorial. i hope it's as easy as it looks. left a comment on MBS. Hi Vickie - love your blog! And thanks for sharing the MBS post! I've never used a traingle ruler like that because they look so intimidating. Happy Quilting! The table topper is adorable -- another project to add to my list for 2011. Thanks for the chance to win! Beautiful tabletopper. I love Fandango and happen to have a layer cake. thanks. How pretty! I would love a tabletopper! Maybe I can still pull one table toppers off before x-mas as a gift... Thank you for the giveaway! The quilting on the table topper is fantastic! Thanks for sharing a great tutorial. Golly! I would be thrilled with either one! I just love this project! Thanks for the great giveaway! Love to get new rulers. Your topper is adorable. I think I'll join three blocks and make a runner. Thanks for the chance for a Christmas gift I'll love! This is a great table topper! I'm going to try and make one this week I think! Love the beautiful runner, will have to go and check out the pattern. Congrats, I love your new Moda project. What a wonderful topper! And great giveaway! Thank you for the chance! Cute pattern and cute fabrics, love it. I'm going to look for the ruler tomorrow! I have been wanting some fandago in the worst way. Thanks for the chance! Awesome giveaway! I'd love to win. Off to check out your new bake shop project. What a great giveaway! And I love you table topper. cute cute table topper!!! thanks for the tut!! A wonderful topper with such pretty fabrics. Love your pattern. Thanks for a great giveaway. The colors on this are so yummy. The tutorial was very good, and I am sure I'll be trying it. I plan to make one of these toppers. Easy to understand directions. Thanks so much for sharing. Awesome giveaway! I want to make that quilt style! I love your table topper. It is so cute. I don't know how you have the time to be a wife, a mom, work full time and quilt so many amazing things! Your table top is awesome!!! Thank you for this fabulous giveaway!!!! Really cute.... seasonal but not exclusively so. Dar-ling! Lovely fabric and adorable table topper. Thanks for the chance to win this fabulous giveaway. Wow, that was definitely easier than it looks--your tutorial is a great visual "recipe"--thanks! What a lovely pattern. I am going to have to find material just to try this out. Love the darling little runner. And Fandango -- gotta have it! Vickie, it's lovely! I left you a comment on the other post too. Love stars. Any kind of stars. Nice work. Love fat quarters, any kind of fat quarters. Love your table topper. Thanks for the giveaway! If reading comments makes your day, you must be having a whale of a day today. You table topper looks really cute and Kaffe's book looks like a good read. Really cute table topper! New to your blog. I plan on making your table topper. It is so fresh and springy looking. Thank you for the giveaway.